Melody Ehsani is one of my personal favorites. As a consumer, I love her oft-eccentric jewelry, her girl power slogans, and the laid back yet regal feel of her pieces. As a business woman, I appreciate her dedication to her female audience and the saavy sense that aligned her with Reebok for collections that have become a staple in the sneaker community. Most importantly though, as a woman Melody isn't afraid to lend her voice and the voice of her brand to causes and issues that affect us all. So, when the L.A. designer linked with photographer Hassan Hallaj to create a Reebok Pump paying homage to Islam’s lovers, we knew exactly what she was doing and a slow clap soon followed. Sized for men and women, the shoe is Ehsani's first his/her shoe designed as the Sadie Hawkins Dance shoe for lovers who want to make a coordinated statement. In the spirit of love, Melody champions the attention to detail she's known for with an embedded image captured by Hallaj inserted into the lining of each shoe. Additionally, the Hamsa (or Hand of Fatima) is embroidered on the side of each shoe. The Hand of Fatima is a symbol which is believed to provide defense against evil. 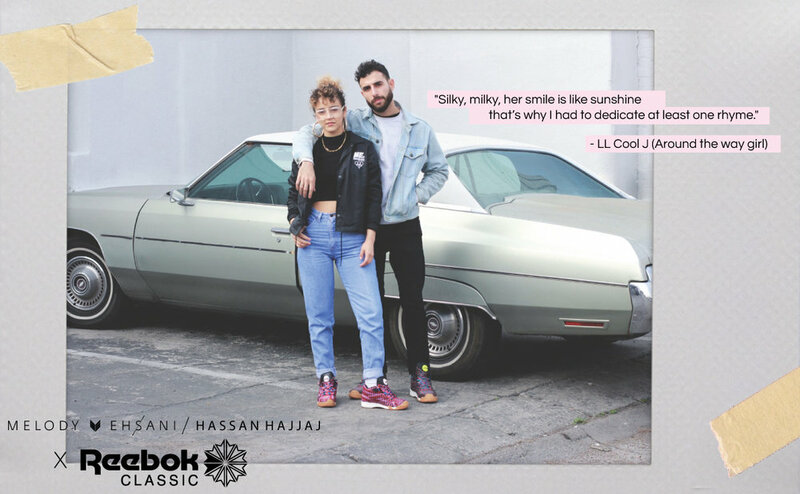 Campaign images for the collection are captioned with loving quotes from some of Hip-Hop's most swoon-worthy songs. Take a peek at the lookbook below. The his collection will go on sale tonight (February 10th) at 9:00 PM PST on melodyehsani.com. This will cost you less than you spend at Brunch. Literally. Breaking bread with Reebok Classic and 20 of Dallas' most amazing women. Our Reebok Classics Influencer dinner here in Dallas was fire. This is what I wore.